This series of posts is a collection of concrete, actionable tips based on my experiences as a third year student at UNMSOM. Please read my introductory post for background and disclaimer information, as well as links to each part in the series. Additionally, here are links to the previous and next posts in this series. The “next” one obviously won’t work until I publish it. This may actually be the last post in this series, we’ll see. Since I’m not sure about that, I don’t want to add a “conclusion” to the end of this post, since that would seem a bit silly if I continued afterward. Instead, I’ll interject here to repeat: third year will be difficult, but you will almost certainly make it through, just like nearly everyone else. Statistically, the odds are overwhelmingly in your favor at this point. Just keep on keepin’ on. Tip #10: Buy a clipboard. For crying out loud, you can get one for $5, delivered to your door if you signed up for Prime, with a built-in ruler and everything. It weighs next to nothing, so if all it does is sit in your backpack all 3rd year, you will have lost… $5. On the other hand, I got the idea from a good buddy, and I’ve been grateful to have it. If you’re going to take notes when you’re in seeing a patient (which I recommend, unless you can just always remember what all of their heart rates and O2 flows are at), this sure beats writing on counters or folding your paper fifty times to make it firm enough to endure your chicken scratch. I’ve seen some students use clipboards that have a built-in compartment that they use to keep their iPads out of sight – this may be another idea to consider. Tip #11: Carry a USB stick. You don’t really need to carry one with you, but I highly recommend that you leave one in your backpack. Some of the computers aren’t real computers and don’t have a local hard drive to save stuff. Most of this will have a USB port, though. So if you’re on a rotation where you can’t put notes into the medical record (and therefore you have to compose them in Word or Notepad or something), you’ll either need to compose your note in an email and save as a draft or save it to a USB. Additionally, if you’re making handouts for a presentation to your team, it’s nice to be able to save it to a USB and then print wherever is most convenient. Tip #12: Save the UNM antibiogram. While you still need to know general antimicrobial strategies for your exams and your future clinical career, you can look like a champ if you know the local bugs’ sensitivities. These sensitivities to various antimicrobial agents are charted out in an “antibiogram.” UNM’s latest antibiogram (as far as I know) is the 2010 version, and it can be accessed from the UNMH Intranet. There’s a button on the left hand pane, something like clinical resources, then you go to epidemiology… something like that. To make things way easier, I copied the antibiogram into a .pdf document that I keep in a folder in Goodreader. Lucky you, I’ve conveniently uploaded it to SMRTpoint here, as always you need to log in with your Sharepoint information. I highly recommend that you put a copy on your smartphone or tablet, so when your team is debating whether or not to add cipro for PA coverage, you can astutely observe that the sensitivity at our institution is not that great (although it may be the best choice dependent on the clinical situation, yada yada yada). And if our antibiogram gets updated, I’ll try to remember to upload the new one and change the link above (you could leave me a reminder in the comments). it doesn’t unbalance my white coat like carrying it in a large pocket. it keeps it out of sight, helping to keep honest people honest. it helps make sure that I don’t leave my iPad on a countertop somewhere. it’s much easier than carrying it by hand all the time. Tip #14: Get a good tumbler. If you are a coffee drinker, there’s a good chance you’ll be leaving the house long before you’ve finished sipping your coffee… several days a week. Make sure you have a good tumbler. My backpack has an external pocket that fits a tumbler perfectly and makes it so I don’t have to risk getting those last few coffee drips all over whatever else is in my bag. Tip #15: Sew the corners on your white coat. I realize this isn’t the best picture, but hopefully you can see what I’m saying. 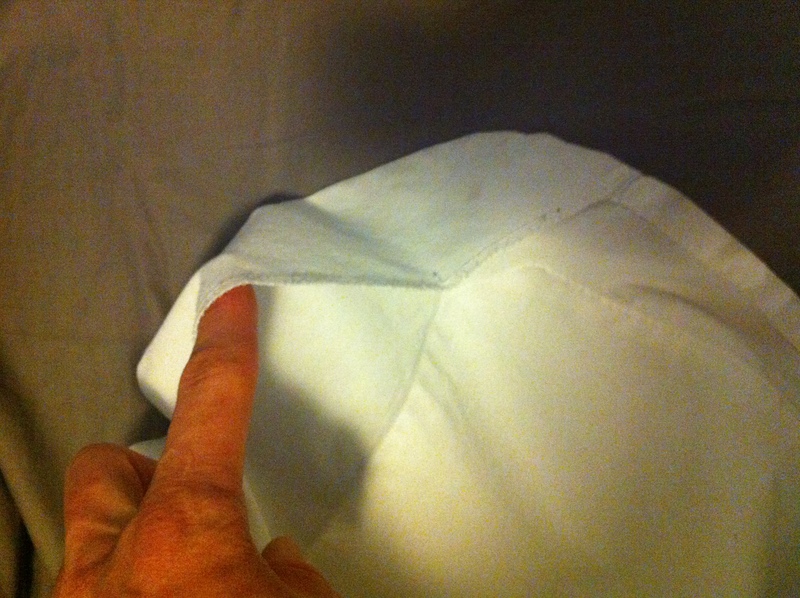 The bottom inside corners of the white coats we’re (generously) given have flaps. For some reason, I catch these flaps on doorknobs all the time. My first attempt to fix the problem involved cloth glue, yellow stains, and having to buy a new white coat. My second attempt has worked out nicely – just sew a little “tack” spot as pictures to prevent the flaps from hanging open and catching on things. Then again, this could just be a Nate problem, maybe you should wait to see if it’s an issue for you first. Tip #16: Buy cheap penlights, and carry one at all times. For some reason, I found my attendings and residents to frequently be unable to find their penlight when they needed it, or to have forgotten to carry one at all. This made for a great opportunity for me to step up with my beaming medical student smile and say, “Don’t worry, I’ve got one!” Sometimes they would forget to give them back. Other times, they’d be touching it with the same gloves they used to examine a sick, sick patient – no thanks, we can stick that one in the biohazard bag. Good think I buy cheap penlights. These are the ones I use, they’re about a buck each, and they generally last me a few months apiece before they break or run out of batteries. While they have a handy pupil-size-o-meter on them, they’re anything but fancy… which is kinda the point. I can lend them out as much as I want without breaking a sweat, and for that reason I’d recommend them any day over a fancy-shmancy calibrated penlight with WiFi connectivity. Besides the obvious, the other big advantage to always having a penlight on you is just having some compassion for your patients. On several rotations you’ll be waking up patients to examine them at times when most UNM students still haven’t gone to bed. Instead of blinding them with the room lights for 10 minutes at four in the morning, why not use your penlight to do their wound check (or whatever else you need to be illuminated) and save your patient the rude awakening? NB: I realize you’ll still have to wake them up. I’m just saying it may be easier for them to get back to sleep if you don’t have to flip the room light on to do your pre-rounding… and usually I don’t think you need to. Tip #17: Guys: leave your ties tied. On some rotations, you’ll be in dress clothes 5–6 days per week. I’m pretty good at tying my tie, but on occasion I just can’t get it the perfect length. Solution: once I get it right, I just don’t untie it at the end of the day. Unbutton the collar, loosen it enough to get it over the head, and hang it on my tie hanger. Next time I want to use that tie, I shave off a minute or so in tying time and know for a fact that it’s the perfect length. Tip #18: Save these bookmarks in your browser of choice. There are a few URLs that you should absolutely bookmark – ones that aren’t particularly easy to find or remember. Make a “School” folder somewhere and save these links, maybe separate from your informational resource bookmarks. Seriously, make these bookmarks right now. MDWeb: where UNMSOM students have to log their work hours and certain patient encounters every block. LoboCash: where you can load money onto your ID card, which you can use to make purchases with your ID at the hospital cafeteria. Remember, the cafeteria doesn’t take credit cards. Med-U.org: several blocks require you to do virtual cases here, and I always forget the site’s name. Everyone tells you this. At least it seemed to me that they did. I thought it was silly, I’ve been doing intermittent fasting off and on for years now, I can handle hunger. AAMOF, after 10 or so days, ghrelin secretion adapts to your eating schedule, so I don’t get terribly hungry, even with 16–20 hour fasts. However, I learned in a hurry that for me, it had nothing to do with hunger. It had everything to do with attitude. My positivity was directly proportional to amount of food in my stomach. As soon as I figured that out, 3rd year totally changed. Even if I wasn’t really hungry, if my attitude sucked and my stomach wasn’t full, I’d eat something… and my attitude (and experience… and probably grades) would consistently improve. Because I wasn’t exactly going for taste, and I didn’t want to expand my waistline too much, I found that I could buy these very filling, low-carb, high-protein bars in bulk and make sure I had 3–4 in my backpack and 1–2 in my sack pack at all times. If I ate one, I’d make sure to replace the one I’d eaten once I got home. Once the box was empty, I’d order another box. Since I had a reserve of 5 or so bars between my bags, the new box would be Prime shipped to my door in 2 days, free of course, and always before I ran out of them. As a warning, these aren’t the best tasting bars, but they’re the best tasting I’ve come across for their macronutrient composition. Tip #20: Start using Instapaper. Reading nothing but academic journals, textbooks, and practice questions will corrode your soul. You need to read for fun as well. I’ve posted about Instapaper before, but I love it enough to give it another mention here. Basically, it saves for later the text and images of whatever article you’d like to read when you don’t have the time or energy to do it now. Lots of great third party apps use it, it has a great bookmarklet for your browser, it works great with your Kindle… and the developer seems like a genuinely nice guy. I come across a ton of interesting content on the web, but I usually don’t have time to read it, so I Instapaper it for later. Instapaper syncs to my iPhone and iPad, so I can catch up on my topics of interest while I wait in line at the cafeteria or when things are slow on the wards. I only use it for pleasure reading, and I love that I never have to regrettingly admit, “I’d really like to read this but can’t afford the time.” One click, and I’ll get to it eventually. In fact, there’s a decent chance that you don’t have time to read this post right now. Why not sign up for Instapaper and give it a test run? Tip #21: Use your creative outlet. I know I ranted and raved at the beginning of this series about only posting “actionable” tips, and I might be breaking my promise with this one. I’ll compensate with brevity. Find a way to foster whatever spark of creativity you have during third year. This is in addition to exercise, good nutrition, good sleep habits – those don’t count. Find something that will keep your creativity alive and make it a priority.